Not only is this our new mission statement at Carolina Auto Image, it is the way that we do business. Christy is a mom of three boys ranging from 5 to 16. She is on the go most of the day, getting them to school, to ball practice and then back home for homework, to start it all over again. Her husband works full time to provide for their family and so their time is limited. Christy drives a new Chevy Suburban for the room and the added safety of a larger SUV. Don is retired military. He has served his country for many years and now has time to enjoy one of his favorite past times and that is local car shows and car meets. He loves his car and doesn’t mind taking some time to get it ready, but he wants it to look flawless. He has a working knowledge of what it takes to maintain a vehicle, but he also knows when to call in the professionals. Eric is an executive with a large firm and has done well for himself. He has multiple cars and loves to take weekend trips to the mountains and to the track to really push his cars. His favorite is his new Porsche GT3, but he doesn’t baby these cars, he uses them. 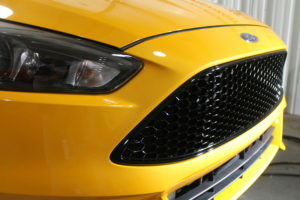 He wants no nonsense protection that allows him to keep the cars looking great, but also makes it easier for him to get the all the track crud off. In these three scenarios you see three different vehicle owners. So do you think all of these owners would get the same detail package??? Not at all, that is why we take an individual approach. Time is a big concern with Christy, she cannot be without her vehicle, but she does have some time every two weeks that she can set aside. Christy’s main concern is the interior of her suburban, with three boys, the interior really gets dirty quick. In Christy’s case, we have found her main concern, so we set her and her husband up on a membership program. 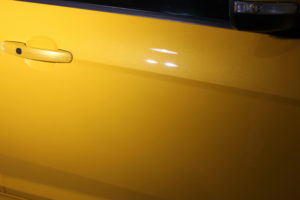 We initially come in and do a complete cleaning of the vehicle, polish the paint and protect it with a good sealant. 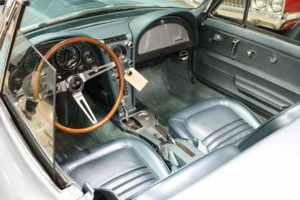 We then tackle the interior, making sure that all the nooks and crannies are cleaned. We spoke to Christy and her husband about interior coatings, and they both agreed that they really wanted the added protection. Now every two weeks, the crew comes by at the agreed time and maintains the suburban for Christy and her husband. The boys love it, they tell mom that the inside smells great. Christy is happy, because she doesn’t have to think about how she can get the suburban cleaned. She can sit inside and have that extra cup of coffee she wants and catch up on her favorite book. Don’s pride and joy is his GTO, he knew when he was young that he wanted this car. He actually had posters and a model of the car, which he still has today. Don’s car is a fully restored replica of his childhood model. 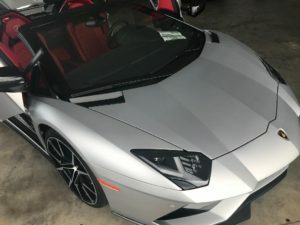 Don is very peculiar about who he allows to touch the car, so after some meetings in person and on the phone, Don has agreed to drop his car off at the studio for a full paint correction and detail. In the following days, we take the black paint on Don’s GTO thru multiple steps of polishing to remove light scratches and to produce a mirror like finish. 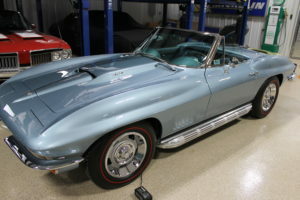 We spoke to Don early about protecting his vehicle, and Don understood all the options, from wax to sealants, into ceramic coatings. Don really likes the warmth of a fine coat of wax and wants to stay true to the era of the vehicle. He does understand that this wax will need to be reapplied, but that isn’t a concern for him, so we hand apply two layers of Swissvax Crystal Rock to Don’s black beauty and just in time for Don to win Best in Show at the local Pontiac event. After some emails back and forth with Eric, he has decided to come in for a consultation. 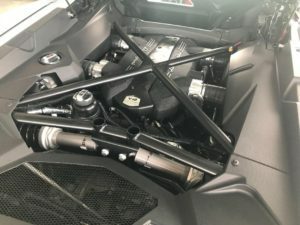 We discuss the use of his GT3 and how since it is an individual color, that he wants to go to the maximum with protection, Especially on the areas that would see the largest impacts from the road and track use. 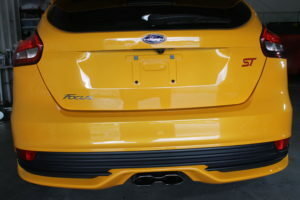 We agreed that paint protection film applied to those areas was a key thing that he wanted. 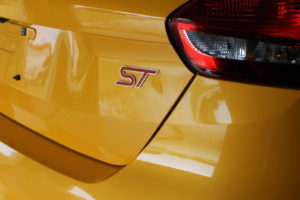 We also agreed to a long term ceramic coating that will allow for easier removal of the track debris. He wasn’t as concerned about the interior, but after hearing about the options to coat, he decides to have that applied as well. One big concern for him was the wheels. Being a matte black and being as the race bred calipers put out a tremendous amount of dust, he really wanted to coat those to make his life much easier. 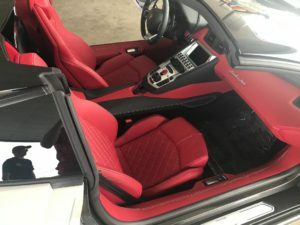 We take Eric’s vehicle thru a full correction process to make the paint gleam and to also prep the surface for the paint protection film, that we installed to the full front, along the lower rocker panels and then custom made a piece for the rear fenders. 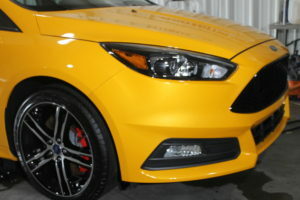 After careful trimming and edge wrapping, we coat the whole vehicle with a long term ceramic coating, wheels and interior as well. Eric couldn’t be more pleased. His last track day, he came in for the fastest lap of the day! He also has brought in his large pickup to have a partial front paint protection film application, since he hates the look of the old plastic bug guards. We also applied a two year coating to it as well. As you can see in each scenario, the needs of the customer was our first concern. We could have easily pushed each customer toward what we wanted, but that doesn’t help our customer. 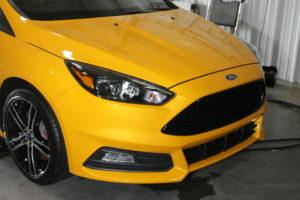 If you have been considering a person or company to handle your vehicle protection and appearance needs, gives us a call, stop by the shop, or send an email and let us start you on the path to always loving your car, no matter what that car or truck does for you. Sunday July 29: Town and Country Ford-Charlotte. Sunstoppers and Xpel teamed up to break the Guinness World Record for number of windows tinted in an eight hour period. We started our day driving up from our home-base with the mobile unit. Some of the Tuner Theory cars were going to be on display, so @Carnucopia (Instagram), reached out to have the cars prepped for the car show that would be happening at the same time as the tint challenge. We arrived around 8:00 at Town and Country Ford, greeted to a beautiful morning and a great spot for us to set up and take care of the first two vehicles. We made the decision to do rinse-less washes on the vehicles, taking advantage of the chemistry to keep from getting the area we were working wet for the numerous people that would be looking at the vehicles. This worked out great, because most of the cars are in good shape before they get to us, but need a little work to put them over the top. Once the morning opened up, more and more tremendous vehicles started to roll in, and Town and Country weren’t to shabby either, having three very great looking SVT Raptors in there show room. 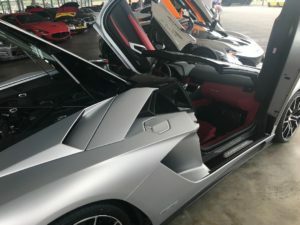 We had Porsches, BMWs, Lamborghinis, Maserati and even more domestic vehicles. Finishing up on the cleaning, we hopped into the mobile unit to get cleaned up and change our clothes so that we could now enjoy the event and catch up with many of our friends in Charlotte. Sunstoppers and Xpel did it!!! It was really a sight to see, two lines of vehicles rolling thru the service bay. Rolls of Xpel tint being plotted out to match the vehicle being worked on, and an army of tint installers and helpers running around and getting the job done! In total Sunstoppers tinted 438 windows in 8 hours!!! 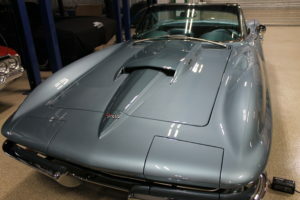 One thing that we have been very fortunate to do, is work with some local collectors as their go to collection detailer. We really focus on the person, and what they need and how we can provide that to them. In the instance of this collector, we go to him. This allows us to keep the car in his shop, so he doesn’t have to load them and travel. Its also nice for us, because the shop is climate controlled, fully plumbed for air with Prevost fittings and….well, all the cars are in great company. 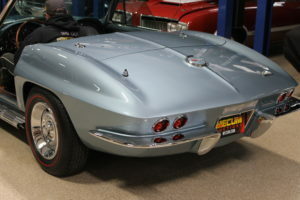 This particular car was a recent purchase from the Mecum Kissimmee, Florida auction. This is one of two that he brought back. 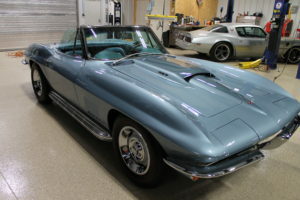 Both are 427 big blocks, with this particular one is a 67 Convertible. Our task was to polish out the light marring to bring the finish back to show ready and protect the paint for future cleaning and show prep. This particular client has grown very fond of Swissvax products, and we are glad that he has, because we are very fond of them as well. All of this collections starts with a rinse less wash process. We use Optimum No Rinse in most instances because most, if not all, of these vehicles only has light dust on them. 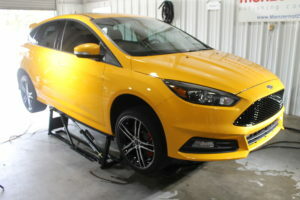 We always clay bar the vehicle, and usually get some form of contamination on most, depending on where they came from. The polishing process is something that many people ask about, and it really is a trail and error situation. 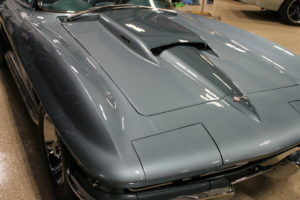 All paint is different, and some of these cars are complete frame off restorations and some are even completely original. We start with a light polish and polish pad, just to see what that will do. In most cases, we have found on these older cars that we end up going to a light compound, because we want to get as many defects out as possible. That being said, we have had times where we go heavy compound to get to where we want….Like I said, it really depends on the paint, and we just let it tell us what it wants. We used D300 with a Megs microfiber cutting disc and followed with Sonax Perfect Finish and a black Lake Country finishing pad. Between steps we did a panel wipe to remove any left over compound or oils. The next step was one that I was skeptical of when I first started using Swissvax products, and it was because I wasn’t allowing it the time it needed. The next step is a hand application of SV Cleaner Fluid Regular. This is a specific pre-wax cleaner and fortifier which makes the surface ready to accept the Swissvax chosen wax. We used to apply it and then try to pull it off right after and we always got streaking and just couldn’t seem to get it off. We then changed our application process and started letting it sit after working a thin layer in and bingo!! That worked. Then we add wax. We have used a couple of different SV waxes, our favorite is Crystal Rock, but alas we are out!! (Note to order). That being said, we do have one that is our go to on most cars when they don’t want to amp up to Crystal Rock, that is SV Endurance. This is a PTFE (Telfon) fortified wax which is a professional install only product. We really like how slick the paint feels after application and curing and how easily water slides right off. 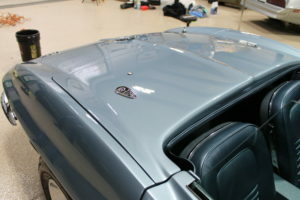 We also polished the chrome which on this car was just to make it really pop and gleam, because it is in excellent shape. Tires were cleaned and dressed to look period appropriate, not glossy, satin.